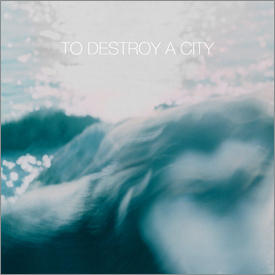 The debut self-titled album from Chicago-based trio To Destroy A City is an album ripe with slow-burning ambience, pulsating rhythms, and soaring guitars. Often building on a theme, the band weaves together pleasing melodic passages, creating compositions that are trance-inducing in their simplicity, yet layered with significance. The uninitiated may find To Destroy A City analogous to label mates Lights Out Asia and port-royal, and, due to some periodic drifting into similar spaces, the wide-screen ambient guitar duo Hammock. Such comparisons stem from the tools To Destroy A City use to convey their message; reverb drenched guitars rub against lofty synths and live drumming entangles itself into deliberate and palpitating electronic beats. This is highly emotive stuff not without its epic moments that can bring a chill to the listener. A debut this seemingly thought out is a rarity and To Destroy A City make it sound as effortless as it is beautiful. This entry was posted on October 4, 2011, 10:30 pm and is filed under Playlists. You can follow any responses to this entry through RSS 2.0. You can leave a response, or trackback from your own site.